When over 1,200 people submit games within 48 hours for a single theme, you’re bound to see some really amazing, innovative, and bizarre takes on it. While many might be mediocre, even the poorer entries might have a glimmer of brilliance hidden in them. It’s like having hundreds of people doing research and development all at once. Monster Mash by Budda allows you to create and customize your own monster. Using the bones of the adventurers you defeat, you can upgrade your body parts and weapons to get more powerful and deal with the stronger and deadlier adventurers. 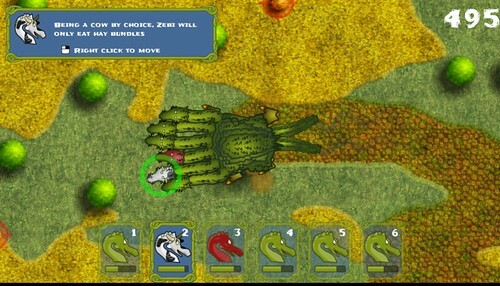 The battle screen features your monster on the left and your enemy adventurer on the right. 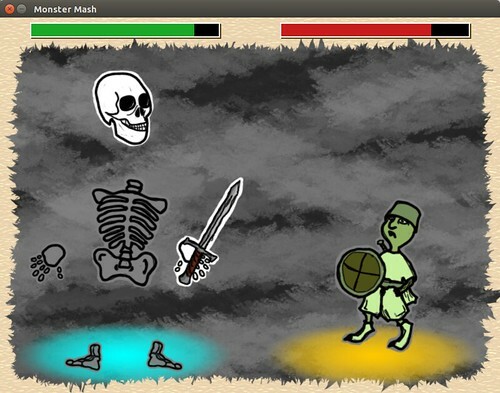 What I liked about it was how the interface was simple and abstract: click on the various body parts to attack and heal. When your enemy hurts you enough, you might lose the ability to use one of your body parts. It’s bizarre to see your head turn red to indicate it is disabled when the rest of your body is fine, but I bet it is terrifying to the adventurers as well. I can see this experiment result in a genre of simple yet tactical mobile games. 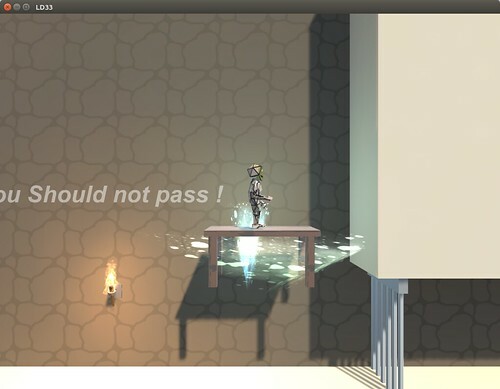 Goloumo by HippGame is a quick platformer. While you can move about and jump, the way to make it through the game is to use your ability to manipulate other objects in space. Click and dragging a table or an elevator when you’re on it, and you can get to areas that would otherwise be impassable. It’s a rough experiment, but I can see this mechanic being used to great effect in a Nintendo DS game. Sirens by miotatsu has you sing to lure ships towards your rocks. It’s art is a bit crude and the audio shows how little polish was expected, but it works well. It’s essentially a tower defense game in which the stationary rocks are both your weapons and your defense. Still, combined with the singing ability to lure ships in on purpose, I think Sirens has a bit more to it than might be expected. Hydra Confusion by concalf has you controlling a hydra’s many heads, ensuring each one is fed and happy. If you mess up, a new head appears, which makes it more difficult for you to manage. Hydras were always cool, and I’ve never seen a game that featured one you could play! Moving about and controlling the individual heads isn’t terribly challenging, but managing them all at once is. 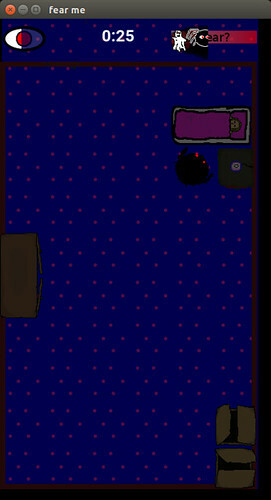 Fear Me by joe has you in the role of a monster trying to scare someone who is trying to sleep. You need to be just visible enough to scare without being too visible and caught. It’s kind of like playing a character in Monsters, Inc. You can hide under the bed or in a box, but it takes up precious time. While I suppose Metal Gear did similar stealth mechanics, this is the first time I’ve seen you in the role of a scary monster. What’s funny is how each Ludum Dare starts with the announcement of a theme that many people will vocally hate. When “Roads” was announced for Ludum Dare #13, I remember people complaining that everyone was going to make a racing game and it was going to be a boring theme. But like most LDs, there was quite a bit of variety present. Similarly, people whined about “You Are the Monster” for LD #33, citing how hard it was to come up with an idea, and yet in just a handful of games I found that no two are alike, and they sometimes bear little resemblance to professionally-created games, but in a good way. It’s mind-boggling how much creativity Ludum Dare unleashed. Years ago, I was given a jazz album to listen to while I worked, but it was so bizarre and jarring that I couldn’t concentrate. I looked up the artists, and it turns out that they combine “modern avant-garde jazz with rock and pop influences.” Ok, sounds great, but it sounded like random noise to me. The thing is, I figured that it must sound good to a more practiced ear, and so I wondered what I was missing. When I asked a friend who is more of a music expert, he explained that avant-garde music is meant to be experimental. Often what someone discovers with avant-garde finds its way into the mainstream eventually. Now, there is a lot more to avant-garde art. It’s not about being a proving grounds for new work but is instead meant to push boundaries and challenge traditional social values. It’s more political than commercial. But the experiments do get leveraged to create commercial works. And playing Ludum Dare entries, I’m reminded of this idea. The game mechanics might be rough and unbalanced, but there’s often a spark of cleverness. Have you seen any interesting Ludum Dare entries worth noting?